In continuation of: Shocking Collusion !!! 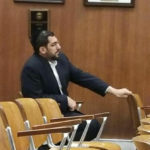 In a nut shell: 10 days after the seniors sued the Lakewood Township for the Masterplan, the builders (Mizrachi & Lichteinstein) go ahead and sue the township. They demand all restrictions to the new masterplan be removed so they may go ahead and build on the former Eagle Ridge Golf Course. The same judge takes both cases and does not notify the seniors about the other case. Total silence. The seniors find out months later, once the judge has already ruled in favor of the builders ( Mizrachi & Lichteinstein ). Now that the masterplan is not in their way, Shaul Mizrachi & Meyer Lichteinstein go ahead and appeal to the planning board to approve this monstrous overbuilding on Cross Street. It is scheduled to be heard this Tuesday night. In the lawsuit and application to the Planning Board it does not mention the names nor addresses of Shaul Mizrachi & Meyer Lichteinstein; the use the names Augusta Holdings, The Park at Lakewood or Moshe Sternstein and the addresses are the office of Adam Pfeffer Esq, 752 Cross Street or 418 Clifton Avenue, Suite 205 which belongs to KBS Capital Partners. Why isn’t GDMS mentioned on any of the new documents? What are Shaul Mizrachi & Meyer Lichteinstein hiding now?? Many on the planning board and someone on the township committee have a direct financial interest….. in this endeavor, therefore cannot vote for this application. The trick is to put it under a fake name, like this it appears to the public as if there is no conflict of interest, hence they may vote on it. After the vote, we will advertise the names and details of these conflicted individuals. Will the FBI look into the this matter?? Will the feds be at the meeting this Tuesday night?? When you are in the cesspool of corruption, you do not even realize (due to the obnoxious odor) that your are committing indictable crimes. Yes there are Shtinkers, that will want to save their a…., and they’ll throw al of you under the bus. How do these people think they will get decent shiduchim for their children??? Maybe epss a yosom fun a gehakte shtub would agree. this miz is something. The real king of lakewood. Let’s start an early pidyon shivuiyim campaign.